Activity: Defender is on cone in middle of 18. First attacker is on top of "D", and second attacker is at cone 30-35 yards out. On coach&apos;s command, first attacker checks into to second attacker to receive a pass. At the same time, defender picks one gate to sprint to. 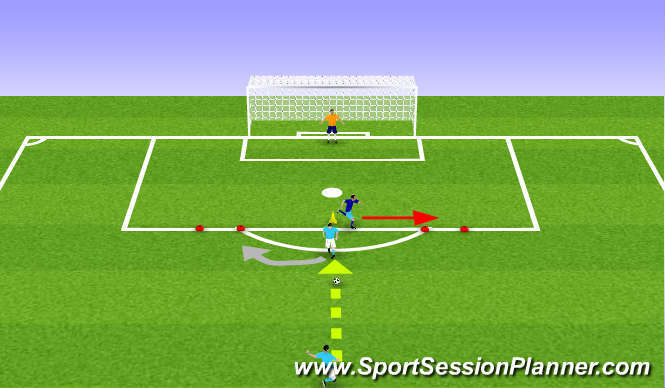 While checking in for the ball, the attacker receiving the ball must check over their shoulder to see either which cone is open, or which one is being defended, and turn towards open gate. Defender only stands in gate they choose in this progression, they do not defend ball. Once attacker is through gate, they look to finish. Attacker who passed now becomes attacker on top of "D" receiving ball. Coaching Points: Must check their should at least once, but if they can, twice. Defender cannot fake going to one gate and go to the other. Turn must be made properly with a good first touch that takes them towards their target. Pass must be quality, and to the foot where the attacker receiving will want to turn. Need to use speed to get through gate and get shot off.